Imagine any type of outdoor adventure, and you will likely find it indoors at Fritz’s Adventure. Featuring 80,000 square feet of activity and exploration, Fritz’s Adventure has it all: rock climbing, sliding, an incredible ropes course, scaling, ziplining, a life-size water tower with slides and tunnels, an actual airplane to wonder through and more. At Fritz’s Adventure, activities are customized for all ages and activity levels. Stay a couple of hours or all day! Conveniently, Fritz’s has a restaurant with healthy options overlooking the facility. The kids will be dreaming of their adventure at Fritz’s all year long. What would the end of summer be without one last trip to the waterpark? And by waterpark, we mean all the thrills and excitement you can find at White Water in Branson. From the heights of the Kalani Towers and KaPau Plummet to the relaxing waves of the 500,000-gallon Surf’s Up Wave Pool, White Water has the perfect amount of adventure and fun for the whole family. Be sure to grab a White Water specialty for a snack, such as a yummy BeaverTail pastry or Hula Hula Taco to keep you going through your time at the waterpark. What a cool way to end the summer. Literally! Branson makes it easy to make learning fun with several of its unique attractions. 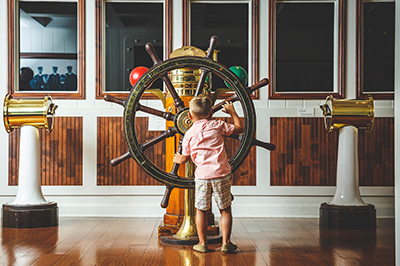 Get a head start on a history lesson at the Titanic Museum. Receive your boarding pass listing an actual Titanic passenger, and discover your fate at the end of the museum tour. See interior replicas of the ship, real artifacts from the voyage, touch an iceberg and interact with the exhibitions of the sloping decks of the Titanic as it sunk. The Titanic Museum makes a fascinating piece of history come alive. For a more scientific angle, check out the Butterfly Palace & Rainforest Adventure. Witness the fluttering of thousands of exotic butterflies imported from all over the world as you walk through the Palace. You’ll learn all about the lifespan of these winged creatures, and you can opt to add to your visit with a trip through the Emerald Forest Mirror Maze, Great Banyan Tree Adventure and the Rainforest Science Center. You’ll be able to cross off any last-minute items for going back to school with the shopping options in Branson. With over 75 designer-brand outlets, the Tanger Outlets are a great place to look for back-to-school outfits and other necessities. Make sure to reward the kids at the Disney Store for being good little shoppers. The Branson Landing is your next destination for school needs. Stroll the paved sidewalks or travel by tram down the shopping center. With over 100 specialty stores, dining options and a unique fountain show, shopping is quite the experience here. You need a memorable meal to end summer and kick off the school year. Branson has plenty of dining options for every meal of the day. Nothing describes breakfast at Billy Gail’s Cafe more than memorable! In addition to traditional country breakfast favorites, the hubcap-size pancakes are a must. You might think you’re full after finishing that pancake, but Mel’s Hard Luck Diner is worth being a little extra stuffed at lunch. You can find classic diner burgers, sandwiches, plate lunches and a full soda fountain, all at Mel’s. Add the singing servers, and you have a perfect environment for an unforgettable dining experience. Speaking of dining environments, Pasghetti’s is your ultimate dinner stop. Themed dining rooms, games and even a Ferris wheel inside make this establishment more than a regular Italian Restaurant. Make sure to stop by the giant meatball outside for a fun picture! After your weekend in Branson, the kids will be ready to go back to school with a satisfying smile on their faces. Treat the whole family to a last-minute getaway, and check out more trip ideas here.